I’ve just picked up the harbor freight 6” jointer and currently own a variable speed 6” Delta bench top jointer. My goal is to have a helical cutting jointer and as I understand it the longer the bed the better the jointer. I picked up the harbor freight because it is much longer than the bench. I couldnt get good results with it because the blades were incredibly dull. I’m going to buy a shelix head for it and sell the delta but want to see if anyone has any feedback about this upgrade or the long term reliability of the Central machinery jointer. Unless you’re face jointing highly figured lumber i highly recommend you get some fresh knife and give it a run first before investing in a shelix head. Five star reviewed sharpening shop in town says they charge 60¢ an inch to sharpen jointer knives. At 12$ I’m going to drop them off and see if the machine works with a fresh edge. Knives aside worthwhile machine to upgrade to a shelix head? Only you can answer that question. If it’s made in Taiwan, chances are it’s just as good as the others from Taiwan, which is pretty darn good! There’s not much going on with a jointer, if the castings are sound, tables flat, fence solid (and able to be squared to the bed), then sure it’s probably worth it – IF you face joint highly figured wood lol. Otherwise buy a spare set or two of knives at $20-25ea and keep spares on hand ready to go. Don’t bother sharpening the blades that came with it. They’re probably junky steel. Get some decent quality ones and use those. All great advice. I’ll have to agree the blades are most likely garbage. I see the point of just doing the blades until I run into an issue where I need a helical head. I’m thinking a jointer is so simple if the castings are level and fence square what else can go wrong? I’m only invested 100$. Helical head is 310$. 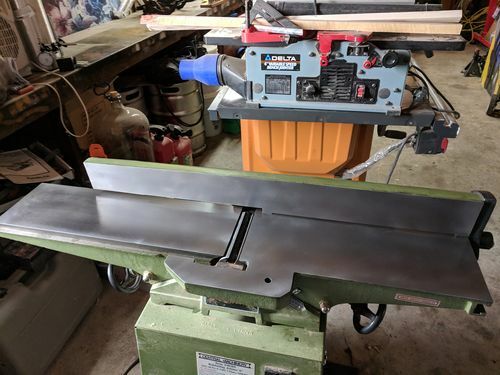 Where else could I get a 42” helical jointer for 410$? Simple machine until you start looking at quality control, bearings and materials used. Do you think the quality of the HF is the same as a Jet, Grizzly, etc. Do you really think the HF blades are good steel. I would not put an expensive head in a HF tool. Buy some good blades and try them and see how it runs and then decide. Got the surface all cleaned up and waxed. Everything is square and straight. New blades installed. My issue seems to be the motor speed. It’s too slow. Unless you’re going super slow it has some tear out. It works just not that well. I’ve invested 120$ into it. Shouldn’t have any problem getting my money out of it.